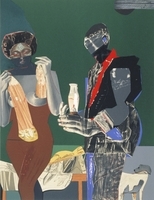 In conjunction with The Romare Bearden Homecoming Celebration, developed by the Romare Bearden Foundation to highlight the achievements of this seminal African American artist, the Brooklyn Museum presents an exhibition of its collection of seven outstanding Bearden pieces. The Bearden Homecoming Celebration takes place in a number of locations in New York City between September 2004 and March 2005. An exhibition of Bearden’s work also opens at the Whitney Museum of American Art in October 2004. This exhibition is organized by Charlotta Kotik, Curator and Chair, Department of Contemporary Art.